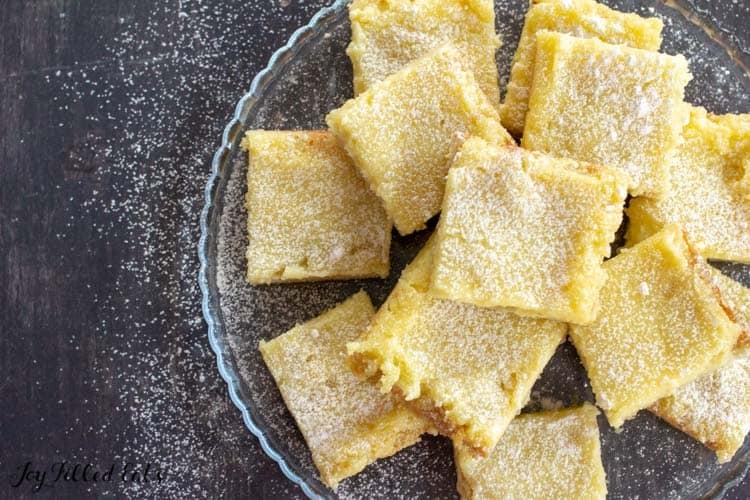 This easy Lemon Squares Recipe comes together in minutes. 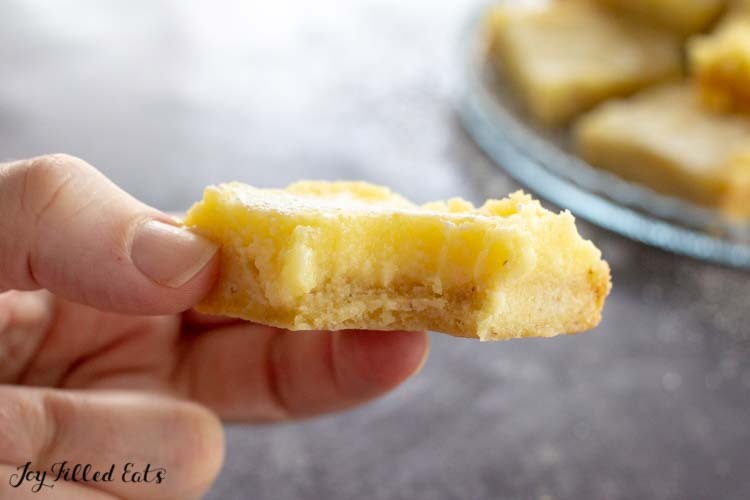 When you are craving a fresh and vibrant dessert my healthy lemon bars will be a perfect fix. I love when readers send me recipes to test. Last month I received this dough recipe from John in my email and I was intrigued by the use of milk powder. I gave it a try subbing in the heavy cream powder I had in my cupboard. It was a great dough! 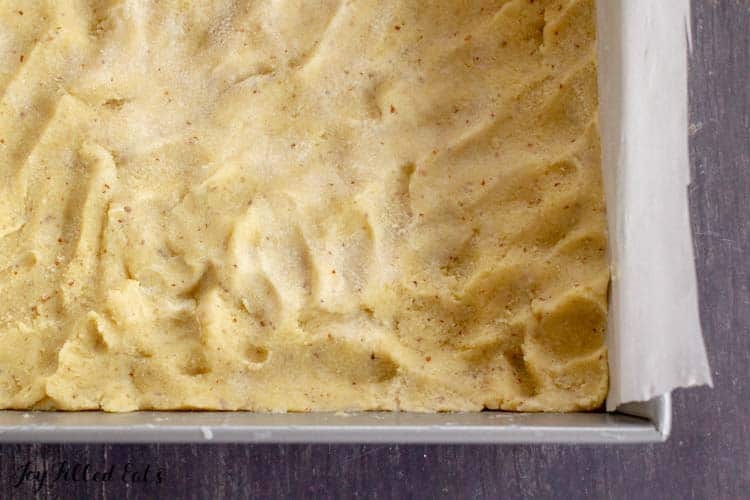 Very easy to work with and easier to make than a fathead type dough. It reminded me of the cream cheese dough I use in my pecan cup cookies. 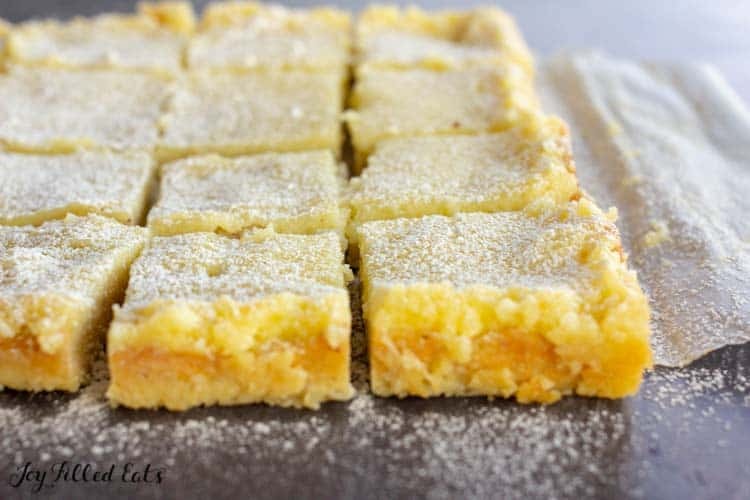 Add in my current craving for light and refreshing spring flavors and this recipe for lemon squares was born. I served these to friends a couple of days after making them and everyone loved them. This cream cheese based crust mixes up in no time. Just add the ingredients to your stand mixer and turn it on. If you don’t have a stand mixer you can mix this by hand or with an electric mixer. This dough is unique in its use of heavy cream powder or whole milk powder. This makes the crust softer and enhances the flavor. If you’d prefer a crust without heavy cream powder try my Easy Low Carb Pie Crust or the crust in my Pecan Cup Cookies recipe. 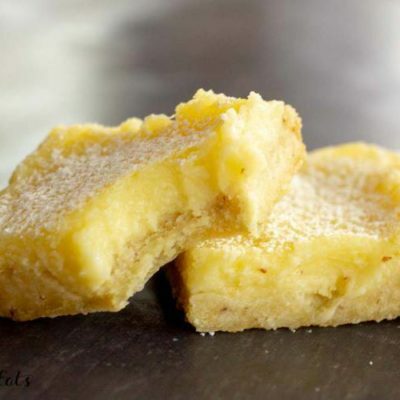 The filling for my lemon squares recipe is made easily either by hand or in your stand mixer. You just want to mix the ingredients until they are smooth. As long as you are using softened cream cheese and melted butter the filling comes together quickly. 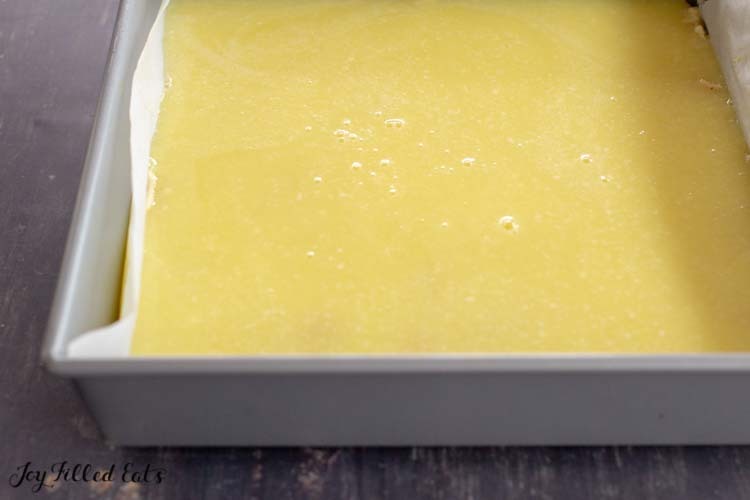 Can I use bottled lemon juice for lemon squares? I don’t remember using bottled lemon juice for a dessert when lemon is the star flavor. The flavor just isn’t as vibrant and squeezing fresh lemons. I love cookies but a lot of the time it’s easier to just press a batter into an 8×8 baking dish. I default to bars and brownies over scooping individual cookies quite often. Here are some of my favorite bar recipes. Preheat oven to 350. Grease an 8x8 baking pan lined with parchment paper. Beat softened cream cheese with paddle attachment in a stand mixer, scrape the bowl and then add the remaining ingredients. Add remaining ingredients into the mixer and mix all together. Mix until mixture leaves sides of the bowl. It is a very soft and delicate dough. Press into the bottom of the 8x8 baking dish. Bake the crust for 10 minutes. Mix together the ingredients for the filling in the stand mixer until smooth. Pour over the pre-baked crust. Bake for 30-35 min or until the filling no longer jiggles if the pan is gently shaken. Cool completely. Gently lift the parchment paper to remove the bars from the pan. Cut into 16 pieces. Sprinkle with powdered sweetener right before serving if desired. I made these for Easter and they were amazing! I could not find whole milk powder so just used regular non fat milk powder since it was only 1/4c for the whole recipe. The lemon part was delicious... but the crust on this was DEFINITELY the star of the show. The texture is AMAZING! This is the first time I’ve had something with a THM crust that I enjoyed! Do you think I could use it for pies too? Seriously amazing! Yes. The crust recipe came from my reader, John, and he said he uses it for mini tarts. It should work for pie too! Maybe not a wet fruit pie but definitely for a pudding pie, pumpkin pie, etc. Hi! First of all, I would like to thank you for sharing all your wonderful recipes. I love trying them. I was really excited about this one because I LOVE lemon desserts. I have a couple questions because mine turned out less than perfect (it never set up, even with like 30 extra minutes of baking time). 1. My sweetener kept settling to the bottom of the filling mixture. Could this have had something to do with mine never setting up? 2. I only have a glass 8X8. I noticed while baking the crust that it did require about 5 minutes of extra baking time. Could that have had something to do with it? 3. Next, I am pretty sure (but not totally sure) this is the reason it didn’t set up. I tasted the filling and felt that the two TB of lemon juice was not enough. All I had was bottled left so I used that to add more. Do you think that is why mine didn’t set up? And finally, 5. What recommendations do you have for me to make this recipe so that’s it’s more lemony and also sets up? Hi Jessica, yes I think that adding additional lemon juice was why your lemon bars didn't set. I would have suggested adding an extra egg to balance out the addition of more liquid. Did you chill it yet? It will firm up further in the fridge. Hi Taryn, Thanks for your reply. So don’t laugh. The consistency of the filling even after if cooled quite a bit was like canned, condensed tomato soup. I didn’t think even refrigerating it would get it much thicker. So, I poured it out of the crust, put unflavored gelatin in it, and put it back in the crust. Don’t get me wrong. They had great flavor, and I love the crust. They just didn’t turn out like yours. I am thinking about just adding the zest of the lemon next time, or will that not work? What are your thoughts about my glass 8X8 and the sweetener not dissolving? Should I invest in a metal 8X8? The sweetener I used was a monk fruit and xylitol blend that is like your recipe for gentle sweet before you powder it in the food processor. Should I have used powdered or should that have made a difference? Thanks so much! I'm going to do a little more recipe testing with this recipe this afternoon. I think lemon zest would be good. And I think powdered sweetener should help too. Did you double the amount of sweetener for the monk fruit blend? I did not double the monk fruit sweetener, and they were plenty sweet. Ok! That is awesome of you! I will let you know the next time I make these which will hopefully be soon! Delicious and simple! Love it! I love anything lemon flavored and these lived up to my expectations! 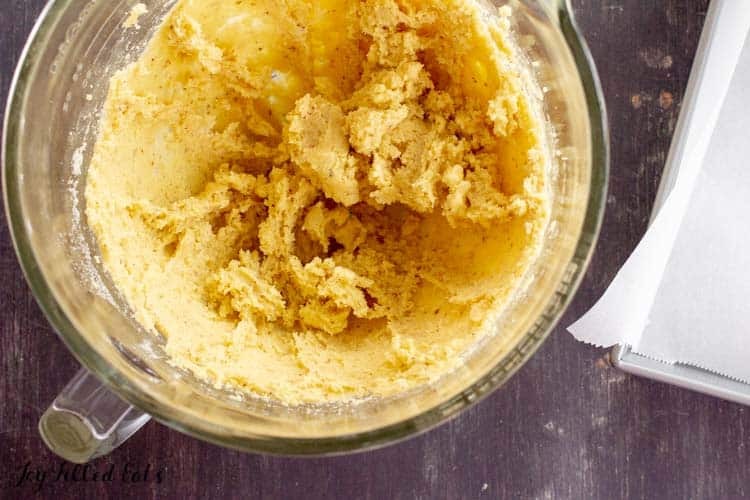 Is there a substitute to use for the heavy cream powder? Is there a ratio of using just heavy cream? 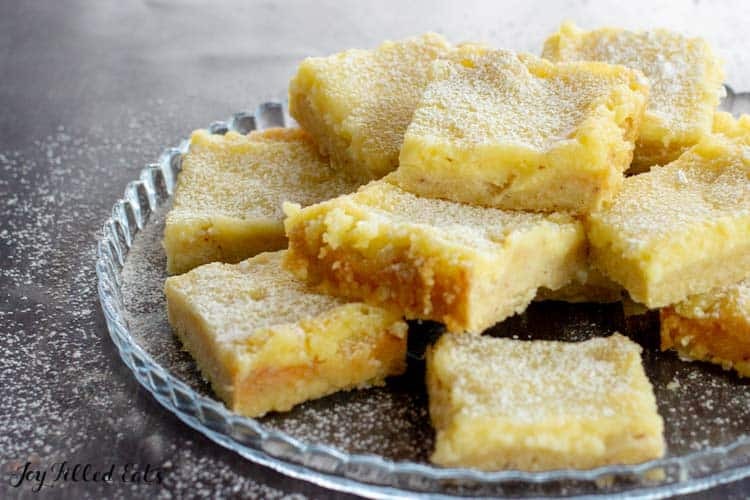 There is a section in the blog post titled "How to Make Crust for Lemon Bars" that talks about this. Regular cream would make it too wet. You can just sub in another dough. A couple are linked above.